When you first switch to a paleo diet, you lose a lot of your standard recipes, are introduced to a bunch of new ingredients, and it’s not uncommon to feel lost in your own kitchen. Today, we have paleo tour guides! Mel Joulwan is the author of the bestselling Well Fed Cookbook Series as well as the popular blog Meljoulwan.com (which used to be called The Clothes Make the Girl.) 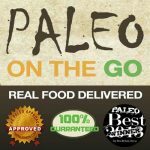 It was one of the first paleo blogs ever and it remains one of the most popular. 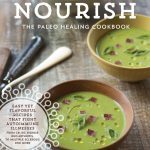 Rachael Bryant is the author of Nourish – A Paleo Healing Cookbook, which is one of my favorite AIP cookbooks. She’s also the voice behind the blog, Meatified. 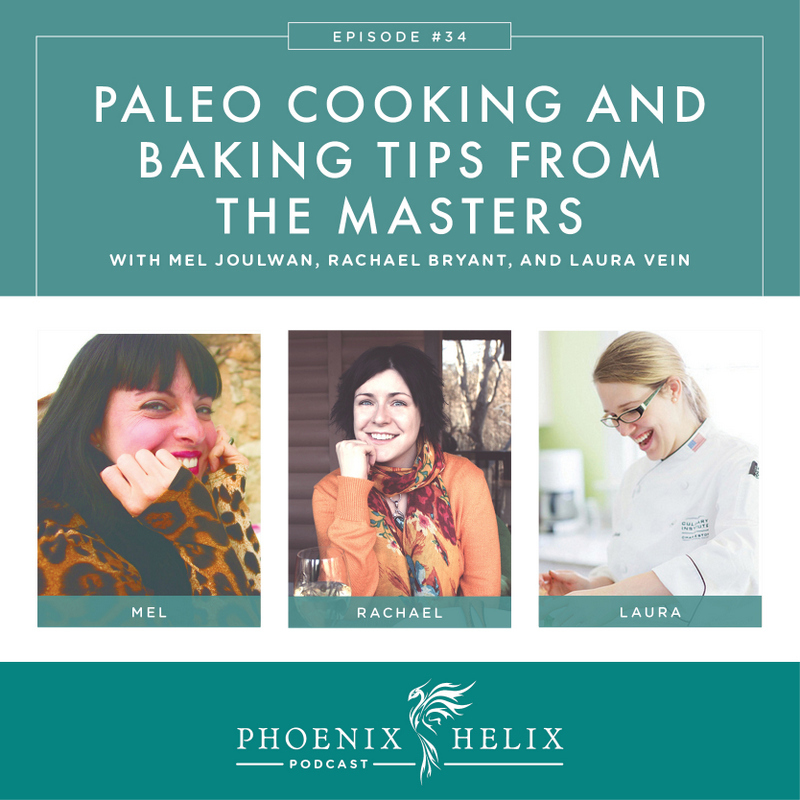 And at the end of the podcast, I’ll be speaking with Laura Vein from the blog Sweet Treats about the ins and outs of AIP baking. Rachael Bryant is the blogger behind Meatified. She's also the author the AIP cookbook: Nourish. She has Hashimoto's. At her worst, she felt lost and frustrated because doctors dismissed her symptoms only wanting to prescribe anti-depressants, and when she was finally diagnosed, the thyroid medication didn't make her feel any better. 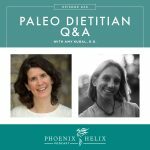 It wasn't until she found the paleo autoimmune protocol (AIP) that her symptoms started to improve. Her fatigue, brain fog and joint pain all went away. Now, she is flare-free as long as she manages her stress and gets plenty of sleep. Mel Joulwan is the blogger behind Meljoulwan.com (formerly The Clothes Make the Girl.) She's also the author of the bestselling Well Fed cookbook series. She doesn't have autoimmune disease, but she has a sympathy for the AIP community because she has tried the protocol herself to improve her own health. In fact, she included AIP modifications in the 2nd and 3rd cookbooks in the series: Well Fed 2 and Well Fed Weeknights. Her health issues stem from the fact that she had to have her thyroid completely removed in 2009, and that gave her clinical hypothyroidism with symptoms very similar to Rachel's. Her initial medication didn't help. It wasn't until Dr. Amy Myers found a medication protocol that worked for her that she started to feel better. Holiday Specials: Their gift certificates are on sale – buy a $60 gift certificate for $50 or a $125 one for $100. You can even buy these for yourself! They will also be putting their meal plans on sale in time for the new year. Mel's Paleo Process: She does a big prep and cook session once a week, to provide fast and easy meals the rest of the week. She describes how she does this in her blog article: Paleo Kitchen: The Method Behind My Madness. Rachael's AIP Process: She doesn't like meal planning because it makes her want to rebel. Instead, she's developed a system of having lots of options on hand including flavor-boosting sauces and condiments that she can put together according to her cravings each evening. She describes how she does this in her blog article: Easy AIP Meals Without Meal Planning. She also shared a trick for eating sardines when you don't like the flavor: combine them 50:50 with tuna. 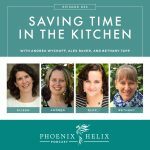 Podcast: Saving Time in the Kitchen. 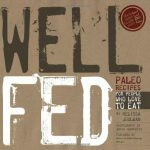 Cookbook: 30 Minute Meals for the Paleo AIP. Rachael's AIP Favorites: Lemon-infused olive oil, Basil-infused olive oil, Mushroom infused olive oil, Four greens pesto, Garlic and artichoke ‘hummus', and Finishing salts. (She also has many condiment and flavored salt recipes in her cookbook: Nourish). My Recipe Roundup of AIP-Friendly Condiments. Through this podcast, it became clear that all 3 of us prefer soup for breakfast! Here's my favorite breakfast soup: Nourishing Chicken. Here's Mel's: Silky Gingered Zucchini Soup. And Rachel creates hers from whatever vegetables are left in her fridge at the end of the week. How to Make Crispy French Fries without Deep Frying: Mel has a great recipe on her website: Crispy Oven Baked Sweet Potato Fries. And for anyone who is concerned with the use of the microwave, both Chris Kresser and Sarah Ballantyne have researched the science and give microwaves their thumbs up. How to Make Crispy Chips without Deep Frying: Rachael actually prefers to just buy them. Her favorite brand is Jackson's Honest Sweet Potato Chips. But if you want to make homemade, she recommends buying an even-thickness white sweet potato. Use a mandoline to slice it 1/8 of an inch thick, and toss the slices in a little oil and your favorite seasoning. Preheat your oven to 400 degrees and place a wire rack on your cookie sheet. Place the chips on top of the rack; this allows air to circulate and help them crisp. Cooking time varies between 15-25 minutes, and if you flip them once it helps them cook more evenly. Be sure to watch them closely. Baked chips can quickly go from crispy to burnt. Mel's Meat Secrets: (1) Seasoning: For every pound of meat, add 3/4 tsp. sea salt and 1/4 tsp. black pepper (omit pepper for AIP). This is the perfect amount of salt to add flavor without being too salty. (2) Boneless Chicken: For chicken breasts, season with salt and pepper and heat 1-2 tsp. healthy fat in skillet and let it get really hot. Put the smooth side of the chicken breasts down in the pan and let it cook undisturbed for 2-3 minutes. Flip the chicken and let it cook 2-3 minutes on the other side. Then add 1/3 cup water to the pan, cover with lid, bring to a boil and then turn heat down to medium low and let cook 15 minutes. The result is golden, flavorful, tender, juicy chicken. For chicken thighs, season with salt, pepper and garlic powder, throw onto a baking sheet and roast in oven at 425 degrees for 25 minutes. They have more fat and don't dry out in the oven. (3) Fattier Cuts like pork shoulder, beef chuck roast or leg of lamb: Season with salt and pepper and put in slow cooker overnight on low. The result is fall-apart, tender meat. You can then spread it out on a baking sheet and broil it for just a few minutes to crisp it up. (4) Lean Grass-Fed Steak or Pork Chops: Heat 1-2 tsp. of healthy fat in a skillet and let it get really hot. Sear the meat 2-3 minutes per side. Then put the skillet it in a low oven – about 250 degrees – until cooked to your preference. (5) Quality meat source: US Wellness Meats. Rachael's Seafood Secrets: (1) She prefers fish with skin attached because if you sear the skin side similarly to meat, it tastes wonderful and is very nutrient-dense. Also the skin seems to protect against overcooking the rest of the fish. (2) When cooking fish in the oven, she places a little bit of fat on top of the fish, adds a simple flavoring like lemon or ginger, and wraps it in parchment paper before baking. (3) For mildly flavored white fish, she likes to top them with a sauce or dressing after cooking. (4) She also loves fish and seafood in soups and stews like Creamy Leek and Salmon Soup, Creamy Cod and Shrimp Chowder or Carrot Ginger Halibut Soup. (5) Smoked Canned Seafood such as smoked oysters and kippers. They have a unique flavor, are nutrient dense and totally convenient. Rachel likes to heat them up with some sweet potato “rice” and AIP-friendly spices like ginger, cinnamon and turmeric. (6) Quality Seafood Source: Vital Choice Seafood. My A-Z Vegetable Recipe Roundup: Vegetables make up the base of the AIP food pyramid. We're meant to eat between 6-14 cups daily. This recipe roundup will hopefully inspire you to try some new ones. A former pastry chef and the blogger behind Sweet Treats, she started AIP in 2014 to address interstitial cystitis, fibromyalgia, IBS and hypothyroidism. She is now in remission for the interstitial cystitis, has been able to come off her fibromyalgia medication, and is working with a functional medicine practitioner to heal her IBS. While her health isn't perfect, she has far more good days than bad and feels so much better than she did prior to starting AIP. 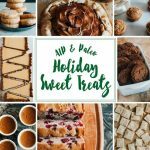 She has since become an expert on AIP baking and is the author of the e-book, AIP & Paleo Holiday Sweet Treats. Baking is chemistry, and AIP ingredients are so different from standard baking ingredients that it's natural for there to be a learning curve. Be gracious with yourself as you learn. Weighing ingredients with a kitchen scale leads to more accurate results. Look for recipes that include weights or use conversion tools online. Have all of your ingredients at room temperature before you begin. Set your ingredients and your mixing bowl on the top of your oven as it preheats. Read through the entire recipe's instructions before beginning. Bake cakes, muffins and quickbreads in their pans placed on top of a preheated baking stone. It makes them cook more evenly. If you don't have a baking stone, you can try using a preheated cookie sheet. Print off whatever recipe you're trying and take notes as you go. Sometimes different brands of the same kind of flour behave differently, so if you can use the same brand the recipe writer links to, that's ideal. Remember that strict AIP isn't meant to least forever, so as you heal and reintroduce foods back into your diet, your baking can expand as well, giving you more options. The classic flours are coconut, arrowroot and tapioca. Some newer flours are tigernut, cassava, plantain, sweet potato, apple, squash, water chesnut and cricket. Coconut requires a lot of moisture, so you'll either see it used in small quantities in AIP recipes or in recipes that use a lot of liquid. Arrowroot can become gummy if too much is used, so it is usually combined with other flours as well. Laura's favorite flour blend is Otto's cassava flour with some tapioca starch and coconut flour. She also likes tigernut flour combined with another starch. While cricket flour might sound a little crazy, it's nutrient-dense and Terry Wahls even calls it organ meat because it's eating the whole animal. Here are some recipes: Sticky Cricket-y Pudding and Cinnamon Crunch Graham Crackers. The most commonly used ones are real maple syrup and raw honey. Laura especially likes orange blossom honey. Laura also likes maple sugar because it's granular and more easily replaces common white sugar in recipes. Other AIP-legal sweeteners are coconut sugar, evaporated cane juice, sucanat, turbinado, molasses, dried fruit like dates, and fruit purees like banana. Keep in mind that even natural sugars can be inflammatory when we eat too much. So, look for recipes with low added sugars, and try to limit your baked desserts to special occasions like birthdays, holidays and celebrations. Sweeteners are a little easier to substitute, as long as you interchange liquid sweeteners for each other (like honey or maple syrup) or granular sugars for each other. If you substitute liquid for granular (or vice versa) it will throw off the liquid ratio of the recipe, so will likely need some other adjustments to balance this change. Eggs help provide structure to baking and hold things together. A common AIP-friendly substitute is a gelatin egg, but this works best if you only include 1 or 2 in a recipe. You can also combine gelatin eggs with other binders like coconut butter, applesauce or pumpkin puree. Panna Cottas are a gelatin-set custard and is on the easy end of the dessert spectrum. Laura has two delicious recipes on her blog: Berry Panna Cotta and Berry Panna Cotta Pie.. Available in hardcopy and kindle versions on Amazon.com on 1/1/16. It will be the topic of the first podcast of 2016! Happy Holidays, everyone!